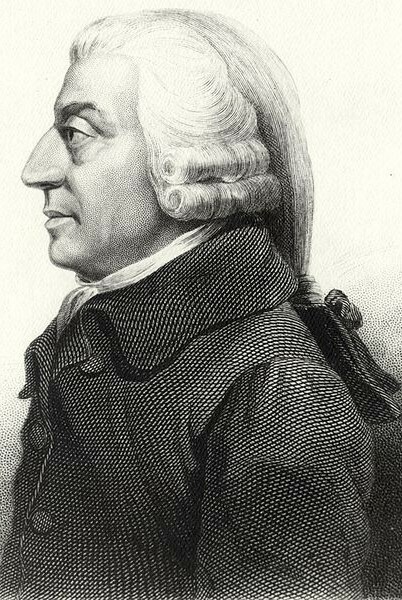 As every individual … endeavours as much as he can both to employ his capital in the support of domestic industry, and so to direct that industry that its produce may be of the greatest value; every individual necessarily labours to render the annual revenue of the society as great as he can. He generally, indeed, neither intends to promote the public interest, nor knows how much he is promoting it. … [H]e intends only his own security; and by directing that industry in such a manner as its produce may be of the greatest value, he intends only his own gain, and he is in this, as in many other cases, led by an invisible hand to promote an end which was no part of his intention. Nor is it always the worse for the society that it was no part of it. By pursuing his own interest he frequently promotes that of the society more effectually than when he really intends to promote it. I have never known much good done by those who affected to trade for the public good. It is an affectation, indeed, not very common among merchants, and very few words need be employed in dissuading them from it. Let us suppose that the great empire of China, with all its myriads of inhabitants, was suddenly swallowed up by an earthquake, and let us consider how a man of humanity in Europe, who had no sort of connection with that part of the world, would be affected upon receiving intelligence of this dreadful calamity. He would, I imagine, first of all, express very strongly his sorrow for the misfortune of that unhappy people, he would make many melancholy reflections upon the precariousness of human life, and the vanity of all the labours of man, which could thus be annihilated in a moment. He would too, perhaps, if he was a man of speculation, enter into many reasonings concerning the effects which this disaster might produce upon the commerce of Europe, and the trade and business of the world in general. And when all this fine philosophy was over, when all these humane sentiments had been once fairly expressed, he would pursue his business or his pleasure, take his repose or his diversion, with the same ease and tranquility, as if no such accident had happened. The most frivolous disaster which could befall himself would occasion a more real disturbance. If he was to lose his little finger to-morrow, he would not sleep to-night; but, provided he never saw them, he will snore with the most profound security over the ruin of a hundred millions of his brethren, and the destruction of that immense multitude seems plainly an object less interesting to him, than this paltry misfortune of his own. To prevent, therefore, this paltry misfortune to himself, would a man of humanity be willing to sacrifice the lives of a hundred millions of his brethren, provided he had never seen them? Human nature startles with horror at the thought, and the world, in its greatest depravity and corruption, never produced such a villain as could be capable of entertaining it. But what makes this difference? When our passive feelings are almost always so sordid and so selfish, how comes it that our active principles should often be so generous and so noble? When we are always so much more deeply affected by whatever concerns ourselves, than by whatever concerns other men; what is it which prompts the generous, upon all occasions, and the mean upon many, to sacrifice their own interests to the greater interests of others? It is not the soft power of humanity, it is not that feeble spark of benevolence which Nature has lighted up in the human heart, that is thus capable of counteracting the strongest impulses of self-love. It is a stronger power, a more forcible motive, which exerts itself upon such occasions. It is reason, principle, conscience, the inhabitant of the breast, the man within, the great judge and arbiter of our conduct.